Packing away the Christmas decorations and welcoming in the New Year naturally brings thoughts of the future, the past, dreams and regrets. Over time, we change, but do we really believe that we’ve become different, more evolved over the years? At 52, I still feel like the same person deep down inside that I was in high school, as a young mother and now a grandmother. I’ve heard people older than myself who say the same thing. Yet, I know how different I truly am. Smithsonian magazine this month has a story about a study on the natural way people think about changes in themselves over time. A Harvard psychologist asked people to consider the person they were ten years ago and found that no matter what age they were, they believed their personalities, values and tastes had progressed during that ten-year period. The study then asked them to look ten years in the future and envision the person they’ll likely become. Daniel Gilbert and his partners found that we believe we’ll pretty much stay the same in the future. The study concluded that most people believe, no matter what age they are, that they have evolved into the person they’ll be for the remainder of their life. I know that right now, I’m more satisfied with my life than ever. I’m very happily married and know that it’s the most solid, satisfying relationship I’ve ever experienced. I have a granddaughter I love dearly, and I’m so proud of my two daughters and the young women they’ve become. I just wonder how much wiser I will be in ten years. Will I learn to control my mouth even more, not say things I regret, and to use each day more wisely? I think we all look back and regret some of the ways we’ve spent our time and effort. I suppose the trick is to also relish the accomplishments, to continue to work toward our dreams, use our mistakes to become wiser and in more control, and maybe get the chance to influence the world around us toward a better place. Will you be the same person in ten years? 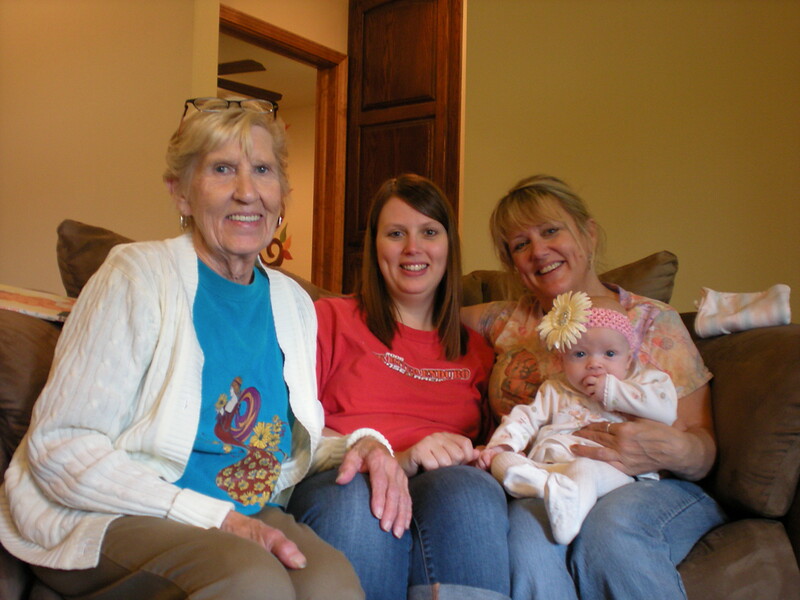 PHOTO: Four generations… My mother, my daughter, my granddaughter and me. This entry was posted in Inspiration and tagged change, Daniel Gilbert, daughters, granddaughter, happily married, Harvard study, marriage, mistakes, New Year's, New Year's Resolutions, over time, satisfied relationship, Smithsonian Magazine, the future, wisdom by Lori Ericson. Bookmark the permalink. I have read many New Year’s reflections during the past days but this is by far the best as it is backed by sound research and, more importantly, conveyed beautifully and wholeheartedly. I was thinking about change today and I found many answers here. Thank you so much for your kind words. I am thinking about change too and hoping for a productive growing year. I wish for you the best. Well, I hope to be a better writer 10 years from now. And I hope I can retire somewhere in that time period. other than that I’m pretty happy with the way things are going. I don’t know how you could become a better writer and still remember us little people! LOL!